VIENNA Audio for Churches specialise in Professional Custom Design and Installation of High-quality Church Audio Systems and Induction Hearing Loop Systems into Churches and Buildings ~ including Specialist Installations, working with Heritage Architects into 'Grade 1 and 2 Listed' Churches and Heritage buildings, plus into many Contemporary Worship Churches across Cheshire, and much of Shropshire, Wirral, North Wales, and NW England, UK. During our specialist work, which includes utilising Acoustic Correction techniques to maximise our results for our Clients ~ we also have Technical Qualifications and experience in Specifying using the latest technology, including utilization of Hi-tech Audio Line-Array Systems for our very specialised Designs and Applications. 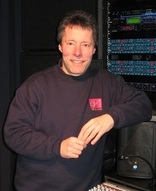 Alan R Jones, BBC Graduate Engineer, and MD of VIENNA Audio (UK) Ltd, is an Ex-BBC TV 'Songs of Praise' Sound Engineer with Specialist experience in Church Sound Systems Engineering up to Full Broadcast level Standards. Having worked with BBC Television, Network Radio Studios & Outside Broadcasts as a Broadcast Sound Engineer for over 15 years, we are qualified to offer you the highest quality Technical Services for your Church Sound System Installation requirements. St Mary’s (Acton) Church, in Nantwich, Cheshire ~ a prestigious Full 'Grade 1 Listed' Church ~ have chosen VIENNA Audio (UK) Ltd to Design and fully install a Specialist Church Sound System, and linked Induction Loop System into this beautiful Listed Church building. Having gone through a full DAC Faculty facility, and working closely with Heritage and Church Architects, the complete System was Specialist installed over the period of a week ~ and our Clients are absolutely delighted with our specialised High-quality results, plus our very neat Installation work, into this wonderful 11th Century Grade 1 Listed building. We worked closely with Heritage Architects both before and during our Installation work, to ensure that we fully preserved the integrity of this beautiful heritage building, and we are very pleased to have achieved another great result for our Clients. This adds yet another successful 'Full Grade 1 Listed' Installation to our increasing Specialist portfolio across Cheshire & North Wales. 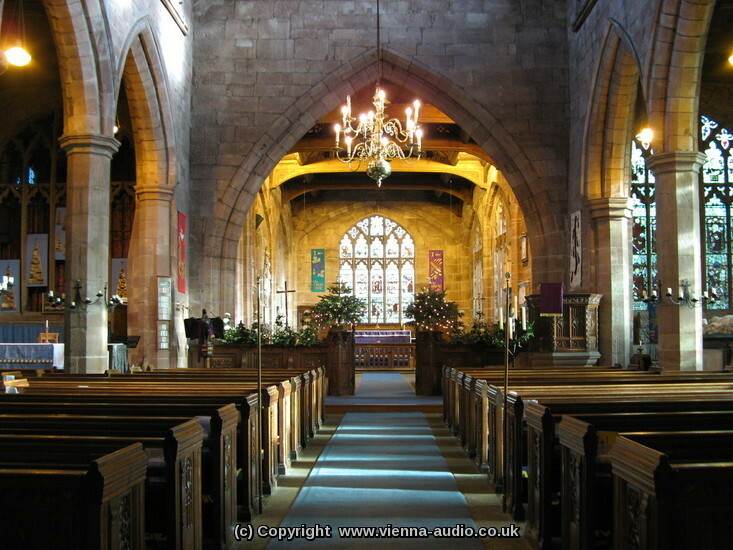 “Alan Jones from VIENNA Audio (UK) Ltd was approached to design and install a new Sound System for St. Mary’s Acton Church, Nantwich, Cheshire. He took time to thoroughly understand the system requirements, and unique problems associated with a Grade 1 Listed building. Through his extensive technical knowledge, he was able to guide and advise us as to the best solution for our Church. Alan and his team installed the System quickly and efficiently, keeping within the budget and finishing on time. They worked neatly and tidily, even accommodating normal church services within the installation period. Once installed, the VIENNA Audio team spent much time instructing the members of the congregation who would be responsible for operating the System, and provided them with a ‘User Manual’. Alan was happy to return to the church after the System had been used for several Events to fine tune, which resulted in us enjoying a superb clarity and fabulous quality of sound. 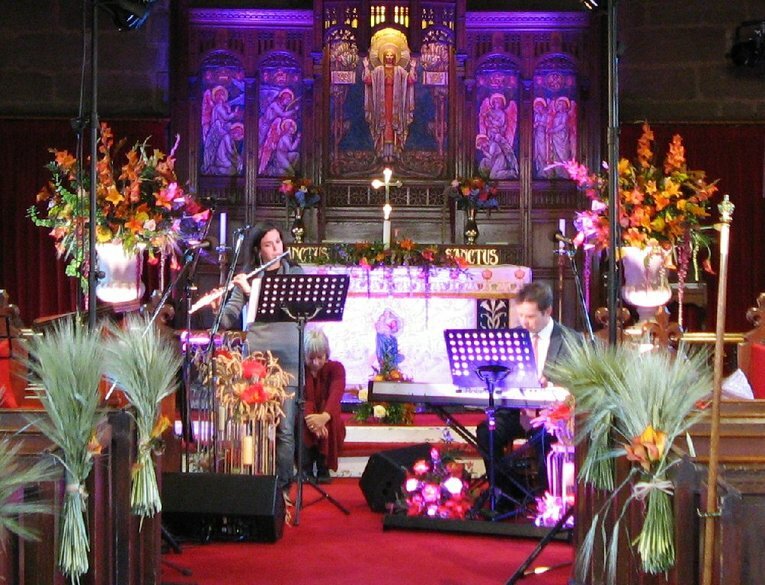 The system was extensively used during our Christmas services and also for several Weddings. Everyone who visited over this festive period really benefited from the quality of the sound produced. It was the first time ever that all the local Primary school children were heard clearly by the audience. We would be very happy to work with you and your team, to specialist Design and Install a bespoke high-quality Church Sound System Installation / or upgrade Equipments to suit your exact requirements for your individual Church building. We offer High-quality Free (No-obligation) On-site Quotations to Churches across Cheshire, and most of : Shropshire / Wirral / and North Wales. 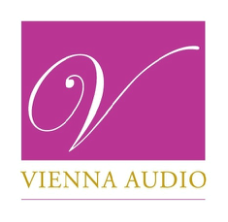 VIENNA Audio for Churches have designed a Free Resource called : '7 Top Tips for Better Sound in Your Church' ~ which will give you more advice on how to improve many aspects of your Church sound. Simply request your copy using the form on our Home page ~ Home page and we will gladly send you a copy of our Report (sent as a pdf) as a useful Reference for you. (© Copyright - Intellectual Property Rights of this VIENNA Audio (UK) Ltd website will be enforced.